A new year is on the way. Time to pack up the holiday decorations and get ready for a bash to welcome 2012. People will be making resolutions and hopefully many of them will be to adopt a vegan lifestyle. What better way to feed yourself with the information you need than to get a subscription to VegNews? 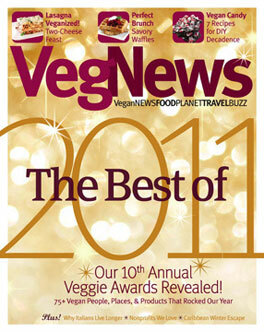 To help out I’m giving away a one-year subscription to VegNews magazine. You don’t have to be making a resolution to go vegan to win but I would like to know what your 2012 resolution is. VegNews is a bi-monthly manual to vegan living. Recipes, travel articles and news from the vegan point-of-view on politics, animal rights and shopping. No other publication covers the vegan lifestyle the way VegNews does. You need this magazine in your life and you’ll have a year of joyous reading for FREE! If you already have a subscription to VegNews and win you can use this to renew your existing subscription. To enter, leave a comment with what your resolution is for 2012. Be sure to use a valid email address so I can contact you if you win. For an extra entry, follow me on Twitter and retweet this tweet then leave a comment telling me your followed and tweeted. Be sure to include your Twitter username in your comment. I will randomly select a winner from all of the entries on Monday, January 9 and notify them by email. Good Luck and Go Vegan in 2012! Egg Nog. I once guzzled that stuff by the carton this time of year. I’m a nog lover. A connoisseur of the nog. AficioNOGdo. If your nog is off then I’ll know it. I’m on top of the nog. Etcetera etcetera… Let’s not think about the sugar and fat content in a glass of that drinkable pudding. 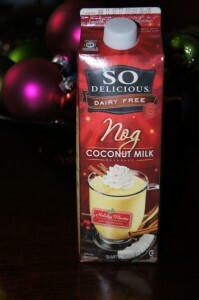 I think it’s very tasty but of course since the vegan switch years ago egg nog has been off limits. Silk has had their variant on the shelves this time of year for a few seasons and now were confronted with other entries in this holiday guzzle-fest. I welcome them all but only want the one that tastes best and can hold up, as in coat the side of the glass, like a true nog should. No thin watery stuff. Nog should to be thick. 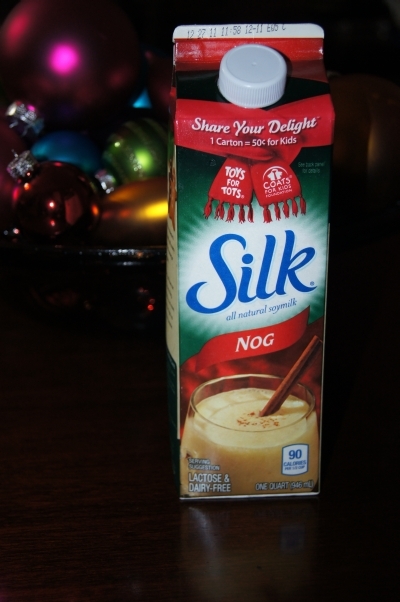 Looking on the shelves in the cold section of the grocery store this season I was greeted by the usual entry by Silk, a good standby when you just have to have the nog but I also found some new ones. So Delicious has a coconut milk version of nog and Earth Balance has their own nog as well. 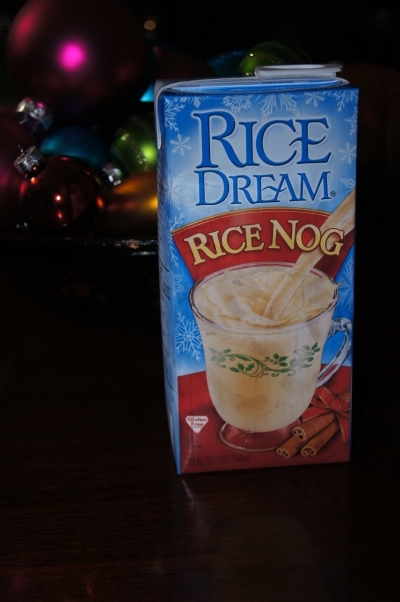 One I was surprised to find is Rice Dream Nog. You won’t find this one in the refrigerated section, it’s in a septic pack. 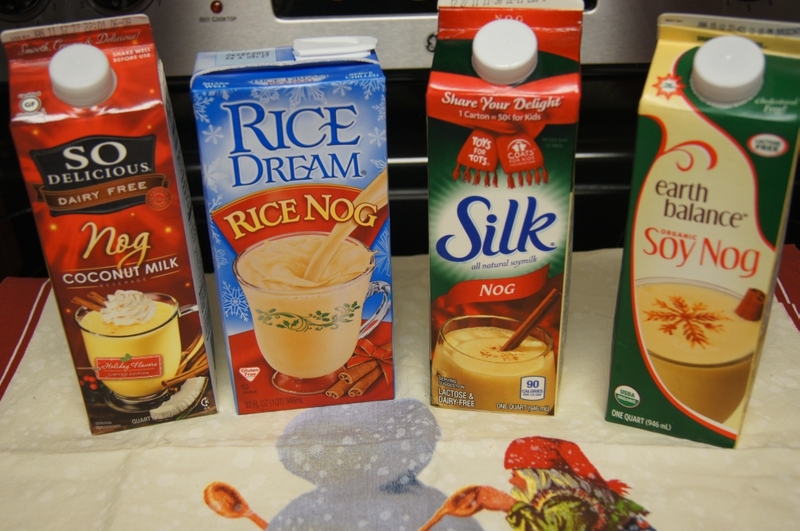 I have four choices now for my nog fix and a decison needs to be made as to the best vegan nog available. The best way to make such a decision and not be skewed is a blind taste test, Pepsi Challenge style. 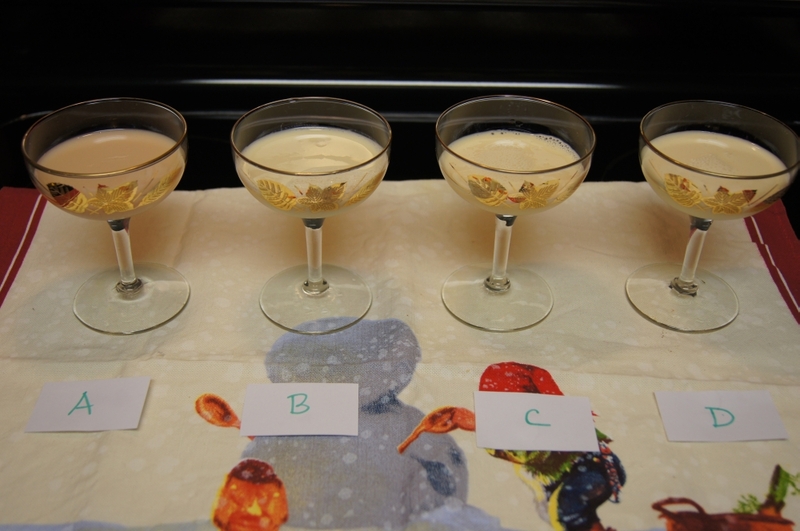 Four glasses blindly filled and letters corresponding to each nog placed in front of each glass. With paper in hand for notes on each nog this nog tasting was ready to get serious. 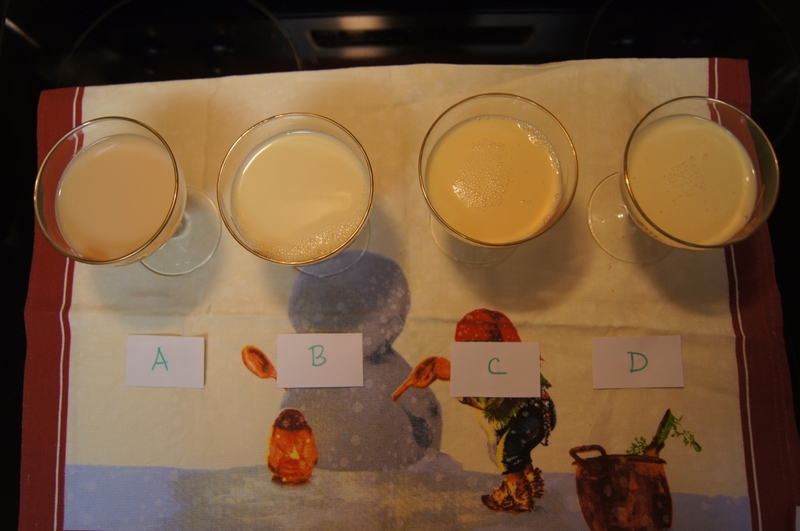 Vegan nog blind taste-tasting ready to begin. Each glass filled and with a corresponding letter. Top view of nogness. Note color. Tasting was not limited to just me. Mrs. Nashveggie and The Kid also participated. Mrs Nashveggie is not the most avid nog fan and it shows in her opinions but it’s still good to get such an objective view included. The Kid, on the other hand, likes most anything sweet. Mrs. Nashveggie: Too pink! I don’t want to taste it… Sweet and chalky. The Kid: It tastes good. Mrs. Nashveggie: Did you put something in this? Smells like yogurt. Tastes like rum. The Kid: I like this one. I think it’s my favorite. Mrs. Nashveggie: Gagged. Too thick. The Kid: It tastes a little sour. Just a little sweet. Mrs. Nashveggie: Where’s the spoon? Thickest one. Tastes too much like coconut milk. The Kid: This one tastes like coconut. Eww. 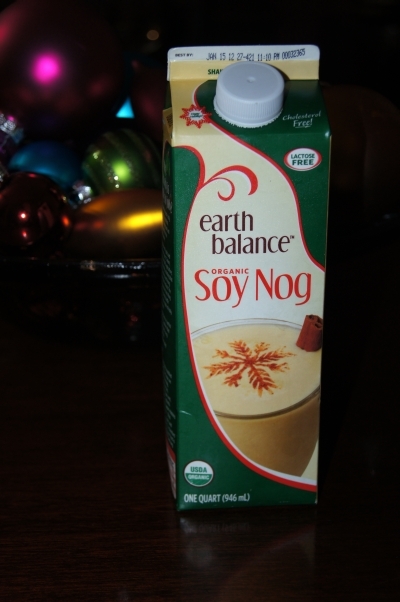 The clear choice of vegan nogs is Earth Balance Soy Nog. A good balance of everything though not perfect. Still, faced with the decision when these four on on the shelf it would be the one to come home from the grocery store with me. Those are my opinions on the nogly offerings you’ll find this season. Suffice it to say Mrs. Nashveggie is not a Nog fan and I’ll not likely let The Kid near that much sugar at a time so I’ll be drinking what’s left of the nogs. Each of the four have room to improve, some more than others. 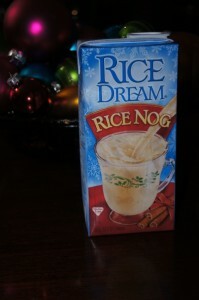 Hopefully next year someone will have the perfect nog. I can hope.